Taste test: These kettle chips are slightly greasy, and have a taste that's a good dill flavor, but not overly pickle-y. There's a slight (very slight) burn that comes to you as part of an aftertaste, but it's nothing where you're going to be running for the nearest cold beverage after you eat some. 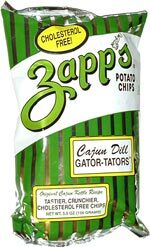 Still, these are a pretty good chip overall. Smell test: Very strong dill flavor, it seems like the dill stayed in the bag instead of on the chip.